It wasn’t bigger than The Beatles, but it did make it into The Beatles’ White Album. It sold 12 million bottles a year in the U.S. alone in its 1980s heyday. 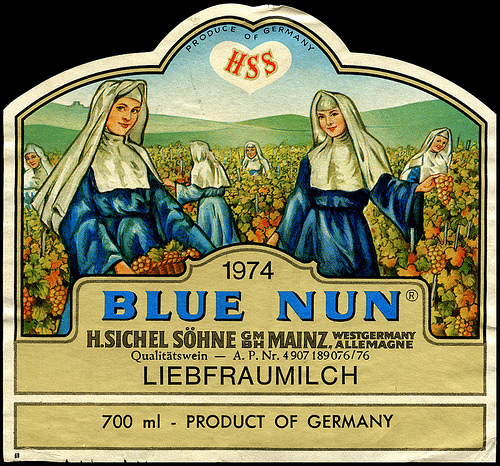 Once the most popular imported wine in the world, Blue Nun wine had a great run before falling out of popular favor and lapsing into obscurity. 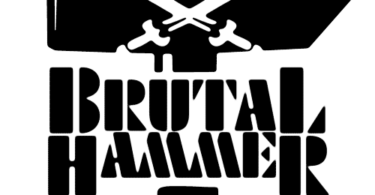 And now, perhaps in hopes of divine intervention, the German company that bought Blue Nun is trying for an unlikely resurrection of the brand. Blue Nun’s roots go back to nineteenth-century Germany, when one Hermann Sichel founded a wine business in Mainz. In 1921, the Sichel firm decided to try exporting wine to the UK. Sichel concocted a version of liebfraumilch: a simple, sweetish white wine blend named for a church in the area where most of the grapes were originally grown. Sichel ackowledged this church connection by putting a picture of a nun on the label. According to wine economist Mike Veseth, a printer’s error turned the nun’s habit blue instead of brown, and so an advertising icon was born. If anyone believed that then, no one believes it now. By the mid-80s Blue Nun sales started to collapse, a victim of its own success, according to Veseth. Introduced to wine by the likes of Blue Nun, consumers became more sophisticated about wine and left the liebfraumilch behind. Before long Blue Nun turned into a punchline, and then was forgotten altogether. In 1996, the German company Langguth bought the Blue Nun label from Sichel in hopes of a miraculous transfiguration. They did improve the quality of the wine, changing it from liebfraumilch to a riesling-based blend. The Blue Nun herself, a reminder of the cheesy ad campaigns of old, was reduced to a tiny portrait on the new bottles. Some new varieties were introduced: a “Sweet Red,” a box wine version, and something called “Blue Nun Sparkling Gold,” a gimmick drink that allegedly contains actual flecks of gold in the wine. The gimmicks continue. Just two weeks ago, Blue Nun announced three upcoming variations, including a “Rosé Edition Sparkling Wine,” and a disgraceful, alcohol-free abomination that I will not name. Probably not worth resurrecting in the first place, it seems safe to predict that the new Blue Nun has no prayer of ascending to her former glory. 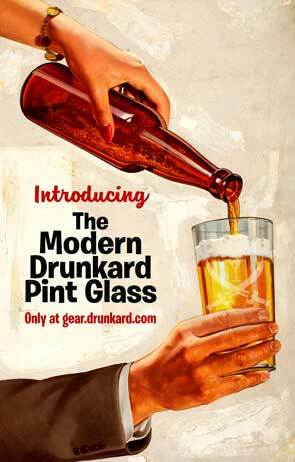 Why the hell shouldn’t there be a Pop Tarts-flavored beer?